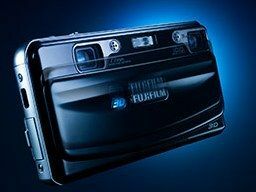 Fujifilm has announced the perfect stablemate for its compact 3D camera, the FinePix Real 3D W1, a dye sublimation 3D printer. What is dye sublimation we hear you cry? Well, for those not savvy in the dark arts of home printing, dye sublimation is merely a method of using heat to make dye stick to a material. In this case, as it is 3D, the material is lenticular. Fujifilm is pitching the computer at the professional photographer and shops short on space, as it measures 0.9m (H) x 0.5m (W) x 0.5m (D) – a size which Fujifilm is touting as portable. "The offering of 3D prints can be established easily without the need for much space," says the release. "It's perfect for event photographers who need a portable system, and for shops where space is at a premium." The new printing system means that shots now come in four print sizes and you will "receive the prints back in days, not weeks, and the cost per print will be reduced significantly". Okay, so it's not the instant availability you are used to with digital, but this is 3D. And 3D is the future, and the future takes its time. There's no UK pricing available for the printer but the UK release date is April. Plenty of time, then, to see if 3D photography is your thing.